Seven games were required to find a winner between Timo Boll and Dimitrij Ovtcharov in the Men's Singles final at the ITTF World Tour event in China, as the latter player pulled off a dramatic victory in June. Five months later and the German stars played out another thrilling encounter on Sunday November 12th with Dimitrij Ovtcharov coming out on top against his close friend once again (9-11, 11-5, 11-9, 6-11, 11-7, 7-11, 11-6) to capture the Men's Singles title at the Seamaster 2017 ITTF World Tour Platinum German Open in Magdeburg. With the home crowd rooting for both finalists there was very little between Dimitrij Ovtcharov and Timo Boll over the course of the opening four games of the match. Then came what appeared to be a significant momentum boost for Ovtcharov as the third seed established a three games to two lead and was closing in on the win with a 5-2 points advantage over his fellow countryman in the sixth end. However, all of a sudden Boll decided to change to a backhand serve and amazingly the alteration in tactics saw the 36-year-old legend recover to push to tie into one last game. The final entered a seventh game and perhaps unsurprisingly Boll continued with the backhand service which had won him a number of points in the previous end, but Ovtcharov eventually found some rhythm and raced into a 10-6 lead. Just the one match point was needed for Ovtcharov to claim his third Men’s Singles crown at the German Open, which he celebrated by warmly embracing his fellow compatriot following the conclusion of the match. “I’m exhausted, really tired, two matches at that level in one day is very hard for us but I gave all I’ve got and it was a very tough final against Timo as usual and I think it’s mostly the mental part giving me confidence winning so many close matches against him, that’s maybe what made the difference in the end. In the last game I was a little angry because I had a good opportunity in the fourth and the sixth games, but Timo was very clever changing the rhythm and the service to bring me out of my rhythm and that made the game very tough for me. I went into the rallies risking many things but I had an amazing start and I’m glad I could get the win in the end”, Dimitrij Ovtcharov. 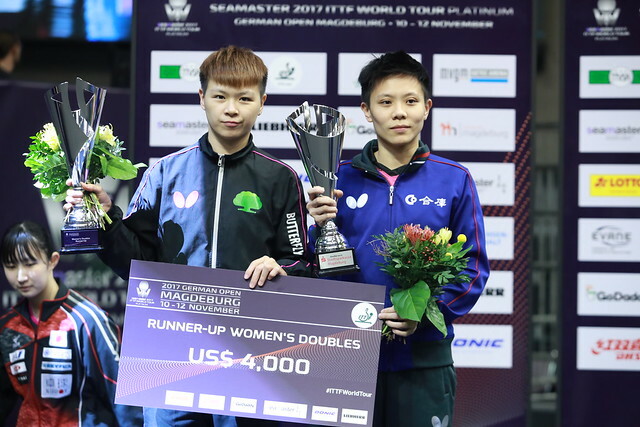 Dimitrij Ovtcharov’s superb year on the international scene continues with the Liebherr 2017 ITTF-Men’s World Cup and now four Men’s Singles trophies from the 2017 ITTF World Tour in his possession. The wait goes on for Timo Boll to win a record fifth Men’s Singles title at the German Open, but another strong outing will give the world no.4 plenty of optimism heading into future events.